•River Cruise Dinner with Suckling Pig, with Vietnamese Song and Dance Performances while watching the Beautiful Saigon River night. •Complimentary 1 bottle of mineral water per day. •Special Cuisine: Vietnamese Cuisine / Vung Tau or My Tho Seafood Dinner / Vietnamese Spring Roll. •Special : Enjoy a cup of sweet “BIT PUT OF COFFEE”. •MY THO – Mekong Waterway Boat tour. •Saigon River Cruise Dinner with Suckling Pig, with Vietnamese Song and Dance Performances •while watching the Beautiful Saigon River night. •Complimentary of 1 bottle of mineral water per day. •Special Cuisine: Vietnamese Cuisine/ Vung Tau Seafood Dinner/ Vietnamese Spring Roll / My Tho cuisine “Elephant Fish + Dinosourian Egg”. •FEATURES * < VIETNAMESE WATER PUPPET SHOW > AS A KIND OF VIETNAMESE TRANDITIONAL CULTURAL PERFORMANCES. *** SPECIAL CUISINE: SEAFOOD MEAL ON BOARD IN HALONG, VIETNAMESE CUISINE, VIETNAMESE SPRING ROLL. 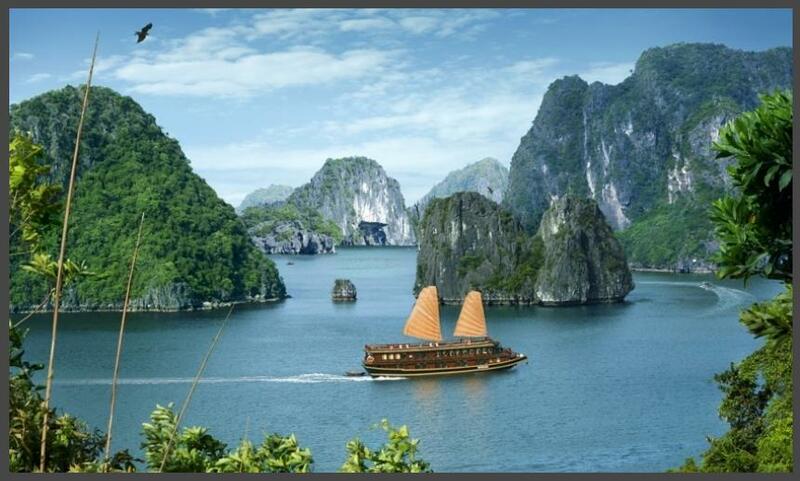 •BOAT TRIP IN HALONG (WORLD NATURAL HERITAGE) + HUE PERFUME RIVER BOAT TRIP & VISIT TO THIEN MU PAGODA. •SPECIAL ARRANGEMENT: SAIGON RIVER CRUISE DINNER, WHILE ENJOYING THE BEAUTY OF VIETNAMESE SONG AND DANCE PERFORMANCES, WATCHING THE BEAUTIFUL SAIGON RIVER NIGHT. •WORLD HERITAGE: THE ANCIENT CITY OF HOI AN. •FAMOUS BEING ONE OF VIETNAM’S SEVEN UNESCO WORLD HERITAGE SITES – THE IMPERIAL CITADEL OF HUE. *** SPECIAL CUISINE: VIETNAMESE CUISINE/ VIETNAMESE SPRING ROLL / SEAFOOD MEAL ON BOARD IN HALONG. •Features *< Vietnamese Water Puppet Show > as a kind of Vietnamese Tranditional Cultural Performances. * < VIETNAMESE WATER PUPPET SHOW > As a Kind Of Vietnamese Tranditional Cultural Performances. •Boat trip rowing on river to discover 5-11 Tunnel Caves in Trang An. •Visit to < SALMON & STURGEON > Cold Water Fish Centre.